Paul Byrd continued his strong second half by beating the Yankees on Wednesday at Yankee Stadium. 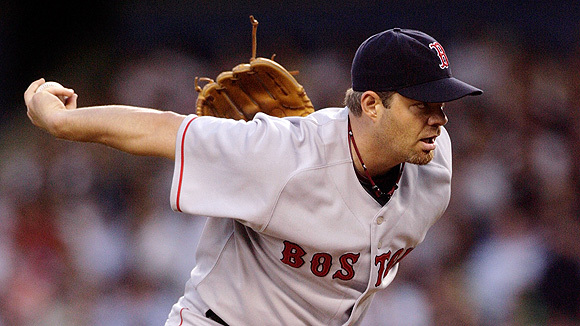 I was talking with Red Sox pitcher Paul Byrd the other day and we got to talking about tipping pitches. It's something even great pitchers struggle with sometimes and something that both of us know from experience. It's one thing if you are injured or not making good pitches. But he was saying how he went back and looked at video and he was making good pitches, hitting good spots. Yet, hitters were right on his pitches. When that happens, you know something is going on. And that is what he found out. He got a message from one of the visiting clubhouses from a team he wasn't going to play again this season, and they told him that he was tipping them off by fanning his glove wider on his breaking ball. Byrd's breaking ball is probably his best pitch, but when people know it's coming, all of a sudden it's not your best pitch anymore. He doesn't have a 95-mph fastball to bail him out. Well, he found out he was tipping his pitches right around the All-Star break and his numbers since speak for themselves. With Wednesday's win, he is 6-1 with a 2.61 ERA. Before that, he was starting to think his career might be over because he was struggling and is an older guy. Now, he might be able to pitch two or three more seasons. I've had my own experiences with tipping pitches. I won 17 games and the Rookie of the Year Award in 1979. Then, I only won three games in 1980 and couldn't get anybody out. I remember one time walking back to the hotel after a game in Pittsburgh; I wanted to practically jump off a bridge. I was so frustrated about what was going on. It turns out it wasn't a sophomore jinx, it was that everybody knew every breaking ball I was throwing. Finally, at the end of the season, an opposing player told one of my teammates that I was raising my arms up higher on my fastball than on my breaking ball. Needless to say, I thanked the guy for that piece of information. Some guys are good enough to get away with tipping their pitches. As a rookie, Dwight Gooden would stick his finger up every time he threw his curveball. The entire National League knew it. His stuff was just so good he went 17-9 and won the NL Rookie of the Year Award. It was amazing that batters knew what was coming every pitch and still were usually unable to do anything about it. In his second year, after he put a piece of leather over his glove to keep his finger down, he was totally dominant and went 24-4. Randy Johnson is a guy like Gooden who can sometimes get away with tipping because his stuff is so good, but even he has changed his delivery several times because he was constantly tipping his breaking ball. His numbers have always been pretty good, so you wonder when exactly he was doing it. But there were times when people knew when he was throwing his breaking ball, yet still weren't able to do too much with it. In Game 6 of the 2001 World Series, Andy Pettitte was tipping every pitch he threw. He would double-pump on every fastball from the stretch. I was broadcasting the game and I noticed it on video in the first inning. We commented on the air and replayed what he was doing and people were going crazy, but the Yankees didn't figure it out until it was too late. He lasted only two innings and allowed six runs. The Yankees lost the game, and then the Series. The ironic thing about tipping pitches is that, when you know what to look for, it's so obvious. Now, you'd think a pitching coach would notice it quickly if a guy is tipping his pitches. Sometimes they do, but other times it can take a while. A lot of times they don't see the video from a home-plate camera. They see it from the center-field camera, and the tipping goes on in front of the pitcher's body. More often than not the reason for tipping pitchers is because a pitcher is trying to get a specific grip. A great example is Ryan Dempster. His unique "fluttering glove" wind-up started because he was tipping off his split-finger fastball. He shakes his glove all over the place now so that he doesn't give anything away to the hitter. Greg Maddux struggled his first year in the league. It turns out he was tipping his changeup. Every time the opposition got a runner on second base they could see him get the grip in his glove and the runner would relay to the batter if a changeup was coming. By extension, they knew most of the time if he wasn't showing changeup it would be a fastball. At times, it even looked like a guy would hit an obvious triple and stop at second base. Well, he figured it out and now he's a lock for the Hall of Fame. Who went deep? Keep track of all the home runs hit each day on Baseball Tonight and on the Baseball Tonight Clubhouse page. Click here to find out who hit the longest home run. For more, check out the Home Run Tracker page. J. Lopez, Sea 12 Min Perkins Bot 4: 0-0, 0 Outs. 1 on. N. Hundley, SD 3 Ari Johnson Bot 7: 2-0, 1 Outs. 1 on. R. Ibanez, Sea 21 Min Perkins Bot 7: 0-1, 2 Outs. None on. C. Granderson, Det 16 Cle Carmona Bot 1: 2-2, 0 Outs. None on. J. Loney, LAD 11 Was Redding Top 2: 1-2, 0 Outs. None on. P. Konerko, CWS 13 Bal Liz Top 2: 3-1, 1 Outs. None on. R. Howard, Phi 36 NYM Santana Bot 1: 2-2, 2 Outs. 1 on. C. Blake, LAD 5 Was Redding Top 2: 0-2, 2 Outs. None on. J. Werth, Phi 18 NYM Santana Bot 2: 1-2, 0 Outs. None on. K. Shoppach, Cle 17 Det Verlander Top 4: 2-0, 0 Outs. 1 on. C. Pena, TB 27 Tor Purcey Bot 4: 0-0, 0 Outs. None on. A. Ethier, LAD 17 Was Redding Top 5: 3-1, 1 Outs. None on. C. Delgado, NYM 29 Phi Kendrick Top 6: 2-2, 0 Outs. None on. B. Boggs, Tex 8 KC Bannister Top 4: 1-0, 0 Outs. None on. H. Pence, Hou 19 Cin Fogg Bot 4: 0-1, 2 Outs. 1 on. M. Mora, Bal 23 CWS Broadway Bot 6: 2-0, 1 Outs. None on. S. Choo, Cle 7 Det Glover Top 7: 0-0, 0 Outs. 1 on. D. Uggla, Fla 28 Atl Boyer Top 9: 3-2, 2 Outs. None on. R. Zimmerman, Was 9 LAD Park Bot 7: 3-2, 1 Outs. None on. J. Dye, CWS 32 Bal Cormier Top 8: 3-2, 0 Outs. None on. C. Delgado, NYM 30 Phi Seanez Top 8: 1-0, 2 Outs. None on. A. Huff, Bal 29 CWS Broadway Bot 8: 0-0, 1 Outs. 1 on. K. Millar, Bal 19 CWS Broadway Bot 8: 2-2, 2 Outs. None on. D. Pedroia, Bos 15 NYY Robertson Top 8: 2-0, 1 Outs. Gr. Slam. R. Ludwick, StL 32 Mil Parra Bot 6: 0-1, 2 Outs. None on. T. Wigginton, Hou 17 Cin Majewski Bot 7: 1-0, 2 Outs. 1 on. J. Giambi, NYY 26 Bos Timlin Bot 9: 0-0, 0 Outs. None on. M. Ordonez, Det 16 Cle Lewis Bot 9: 1-1, 2 Outs. 1 on. E. Brown, Oak 13 LAA Saunders Top 2: 1-2, 1 Outs. 1 on. B. Molina, SF 11 Col Hernandez Bot 7: 0-1, 1 Outs. None on. P. Sandoval, SF 1 Col Hernandez Bot 7: 0-0, 1 Outs. None on. "Baseball Tonight" wants to hear from you. Click here to vote for the all-time franchise players for all 30 big league teams. "Baseball Tonight" and SportsNation agree: Babe Ruth is the greatest Yankees player of all time. Watch on Friday when the Orioles' best is revealed at 12 a.m. ET on "Baseball Tonight." On Wednesday, Tampa Bay's Matt Garza again worked his magic on the Blue Jays, tossing 7 2/3 shutout innings in a 1-0 win against Toronto. When Garza wins, he is dominant. In his 11 wins this season, Garza has allowed six earned runs. • Carlos Delgado connected on a pair of homers as the Mets put behind them Tuesday's debacle against the Phillies to pick up a 6-3 win in Philadelphia on Wednesday. Delgado's second homer was his 30th this season, marking the 11th time in his career he has hit at least 30 in a season. • Sidney Ponson had a short outing against the Red Sox, lasting just 4 2/3 innings. Ponson gave up seven hits and four runs as the Yankees lost again. • White Sox starter John Danks gave up seven runs in four innings. It didn't get better after he left; instead, it got worse. Lance Broadway followed and gave up seven runs during the next four innings. • Red Sox at Yankees, 1:05 p.m. ET: In what could be the Red Sox's goodbye to Yankee Stadium, Jon Lester (12-5, 3.49 ERA) takes to the mound to try to finish off the series sweep and, perhaps, end the Yankees' hopes of making the playoffs. Lester is 2-0 with a 1.13 ERA against the Yankees this season. Mike Mussina (16-7, 3.45 ERA) has not been nearly as productive against the Red Sox, going 1-2 with a 5.52 ERA vs. Boston this season. • Phillies at Cubs, 8:05 p.m. ET: Ryan Dempster (15-5, 2.85 ERA) has not allowed more than two runs in any of his previous seven starts and nine of his past 10. After going more than a month without a win, Cole Hamels (11-8, 3.20 ERA) has won his past two starts. In those two outings, he struck out eight without giving up a walk. • Twins at A's, 10:05 p.m. ET: Nick Blackburn (9-8, 3.78 ERA) takes the mound as the Twins continue their road odyssey. Blackburn is 0-2 during his past three starts, which included a loss against the A's on Aug. 18 when he pitched eight solid innings, but got just two runs of support in a 3-2 loss. Dana Eveland (8-8, 4.30 ERA) is 1-2 with a 9.16 ERA since the All-Star break. Will Harris examines the pitching matchups for the eight games on Thursday's schedule. • 1970: The Giants' Juan Marichal defeated the Pittsburgh Pirates 5-1 for the 200th win of his career. He became the second active pitcher to reach 200 wins, joining another future Hall of Famer, Jim Bunning. • 1977: The Angels' Nolan Ryan struck out 11 batters to reach the 300 strikeout season mark for the fifth time in his career. The Angels lost the game, though, 6-1 to the Orioles. • 1987: Mike Schmidt continued to climb baseball's all-time home run list, passing both Ted Williams and Willie McCovey with the 522nd of his career in an 8-1 win over San Diego. • 2001: Alex Rodriguez became the ninth player, and the second shortstop, in major league history to hit 40 home runs in four consecutive seasons. The first shortstop to reach the plateau was Hall of Famer Ernie Banks, who accomplished the feat from 1957 to 1960 for the Cubs.